For all iCloud’s integration with OS X, the one thing that Apple’s cloud service isn’t very good at is arbitrary file storage. Want to save some random file and have it automatically synced between your Macs? There’s no easy way to do so, unless that file works with an iCloud-compatible app like Preview or one of the iWork apps. Even then, you can only access it from within that particular app. Zibity’s iClouDrive 1.18 is a simple solution to that problem. Run the app and it creates a folder in—by default—your home directory; any file you drop in that folder is automatically synced to any other Mac on which you’ve also enabled iClouDrive. (iClouDrive works by creating a folder in ~/Library/Mobile Documents, which is the hidden folder that iCloud uses to sync data; the alias in your home directory points towards that folder.) The files are locally stored, so you don’t need a network connection to open them. iClouDrive is pretty bare bones as apps go; the only real option is to specify a different location for the iClouDrive folder by holding down the Option key while clicking Enable iClouDrive in the installer. But the app works exactly as described, automatically shuttling documents between Macs with the app installed. 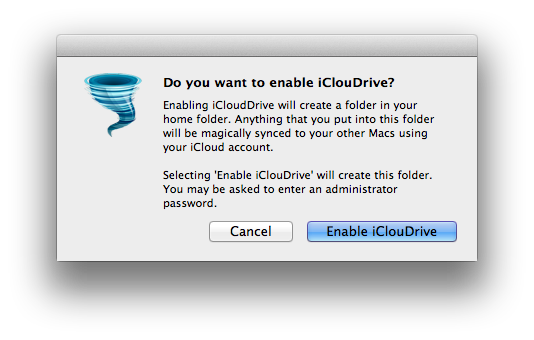 One thing iClouDrive lacks is an uninstaller. It is possible to disable by deleting the iClouDrive alias, but you need to make sure to delete the files within it manually first, or else they will continue eating up your disk and iCloud space. If you’re not a Dropbox user, and you’re looking for some simple, free file-syncing, iClouDrive may be fine for your needs. 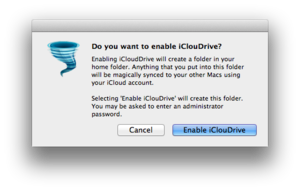 iClouDrive creates a folder where you can access files saved to iCloud.